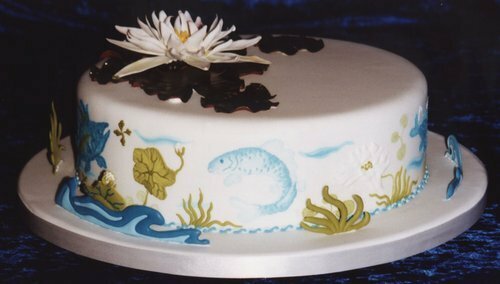 A striking three tiered wedding cake in a chinese blue and white style and representing earth, water and sky. Curved runouts on the boards give a three dimensional aspect to the sides which are decorated with brush embroidery and extension work. The flowers complement the side decoration and represent the three elements.